Human vision is not limited to what we can see in front of us. Our eyes have the ability to see, albeit not as clearly, as much as 100 to 110 degrees on either side when we look straight ahead. We often take this side vision for granted and do not even detect when it is gradually lost until the loss is severe. However, it is important to understand why this vision loss occurs as it may be a sign of very serious conditions which may eventually even lead to complete blindness. 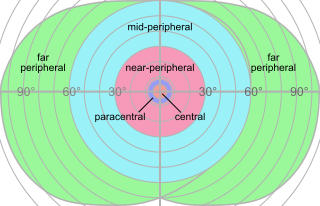 Peripheral vision is the wide angle vision beyond the central vision. It is important to understand what central vision means in order to understand peripheral vision and related problems. Central vision is the what you see when you look straight ahead. It is usually very clear and sharp. Central vision comprises approximately 3 degrees of the most acute vision and about 13 degrees in total. Beyond these limits lie the peripheral vision. The limits in each direction varies. When looking straight ahead, the peripheral vision is limited to about 60 degrees inward (toward the nose) and about 100 to 110 degrees outward (away from the nose). The vertical limits are approximately 60 degrees upward and about 75 degrees downward. In peripheral vision loss this sidewards vision (inward, outward, upward, downward) is lost to varying degrees while the central vision is intact. In moderate to severe cases peripheral vision loss is similar to looking through a narrow tube and for this reason it is commonly referred to as tunnel vision. It is important to understand how vision works. Light enters the eye through the cornea then passes through the lens which bends the light rays to focus it. The image then falls on the back of the eye in the area known as the macula. In the center of the macula is a small pit known as the fovea. The macula is a specialized part of the retina where the vision is the clearest. However, the fovea is the small area which comprises the sharpest part of the central vision. 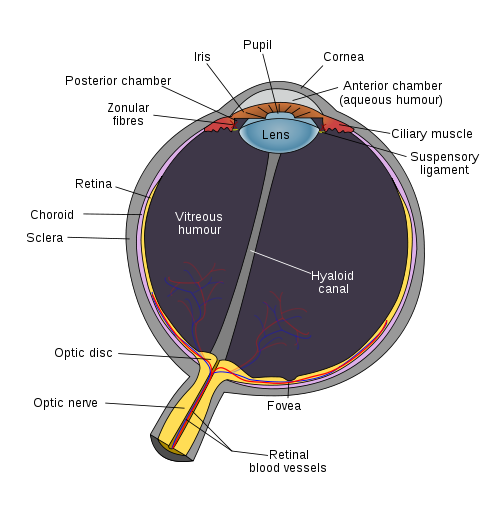 Light that strikes the center of the fovea is responsible for central vision and light falling just around it is referred to as the paracentral vision. The light that strikes these areas stimulate specialized receptors known as rods and cones. These rods and cones generate electrical impulses which are then carried by the optic nerve to the brain. Certain areas in the brain known as the visual cortex then decode these electrical signals and allow it to be perceived as images. With peripheral vision loss the problem usually lies in the retina, optic nerve or brain. Detached retina is where the light sensitive layer, the retina, tears away from the underlying layers which provide it with oxygen and nutrients through the blood supply. The retinal cells are therefore starved of oxygen and can die. Retinitis pigmentosa is an inherited eye diseases where the retinal cells are damaged and there is a dark pigment deposited in the retina. Eye stroke is where the blood vessels of the eye (retinal artery or vein) become blocked thereby impairing the supply of oxygen and nutrients, as well as the drainage of carbon dioxide and wastes. Glaucoma is a condition where the optic nerve becomes damaged and this is mostly due to high pressure within the eye (raised intraocular pressure). It is one of the more common causes of tunnel vision. Optic neuritis is inflammation of the optic nerve which carries signals from the eye to the brain to be deciphered as vision. The inflammation affects nerve signal conduction. Papilledema is swelling of the optic disc, the ‘blind spot’ in the eye where portions of the nerve cells exit the eye to transmit signals to the brain. It is usually due to raised intracranial pressure. Stroke is a condition where a portion of the brain tissue dies due to interruption of the blood supply to the brain. It is a common cardiovascular condition that is potentially fatal. Concussion is an injury to the brain that occurs with head trauma. The extent of the injury can vary but most injuries are mild and heal spontaneously with time. Temporary tunnel vision can occur for a number of different reasons. Extreme emotions and acute psychological stress can cause a sudden rise in adrenalin levels which leads to temporary tunnel vision. Alcohol and certain drugs can also have a similar effect but the condition resolves with time. Some migraine sufferers may also experience temporary tunnel vision. Complete blindness is possible in certain causative conditions. Not all these symptoms may be present at the same time as the tunnel vision. Since most cases of peripheral vision loss are of gradual onset, regular eye tests are advisable for high risk groups like the elderly. There is no specific treatment for peripheral vision loss. The choice of treatment depends on the underlying condition. While specialized eye wear may be able improve the visual field to some extent, it is not a treatment or cure for peripheral vision loss. If the cause of peripheral vision loss is properly treated, it could halt and possible even reverse the tunnel vision. However, in some cases the vision loss is irreversible. For this reason early detection and prompt treatment is so important to prevent or minimize the extent of tunnel vision.